Harry and Carol Callie were just 19-year-old newlyweds when they first opened the doors of Callie’s Candy Kitchen in Bangor, PA in 1952. In 1972, the Callie family moved the business to Mountainhome, located in the Pocono Mountains of Northeastern PA. Since then, Callie’s Candy Kitchen has become popular among locals and vacationers alike. In the Poconos, Callie’s is synonymous with candy. In addition to the classics, you’ll find an assortment of unique treats at Callie’s Candy Kitchen. 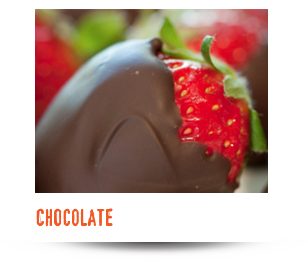 Potato chips, licorice, cream cheese – you name it, Callie’s will cover it in chocolate. Today, Harry and Carol’s dream lives on through the work of their family. In the Spring of 2015, a candy museum was opened inside Callie’s Candy Kitchen. 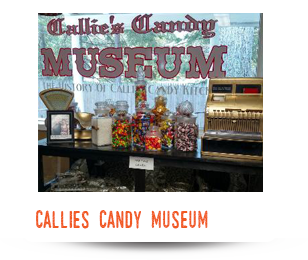 The museum celebrates the life of Harry and Carol and showcases the art and history of candy making. Visit the museum, free of charge, during normal business hours. Visitor’s tip: The outdoor decorating is just as impressive as indoors. Make sure you take time for a group picture!